Amidst all of the Winter Olympic frenzy, another piece of culinary artistry has risen in Vancouver—specifically at the Fairmont Pacific Rim. 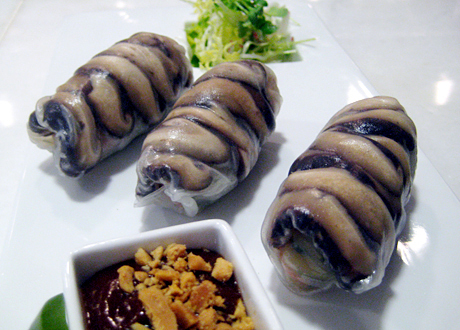 The vibrant Oru Restaurant is described as “pan-Asian” cuisine but is truly so much more than that. Named for the Japanese word meaning “to fold” (and featuring a 54 metre long origami light sculpture by my other half, Joseph Wu), Executive Chef David Wong interweaves a mix of rich diverse flavours with fresh local ingredients, from the abundance of sea or land. Every Asian dish—whether it be Chinese, Japanese, Indian, Korean or plain Asian fusion—is prepared authentically with precision and sophistication. Vietnamese Summer Roll Pickled shiitake mushrooms, vermicelli, hoisin-peanut sauce – Very flavourful, delicate and oh so tasty! A lovely dish as a starter. 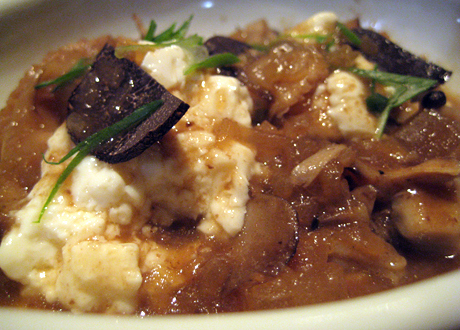 Homemade Tofu with Maitake Mushrooms Mongolian truffle sauce, braised daikon – Looks like and tastes like Asian home comfort food. A mix of both hard and soft tofu are prepared on the premises. Tofu by itself may be bland to the novice tofu eater, but Oru’s version highlights delicate textures and flavours. 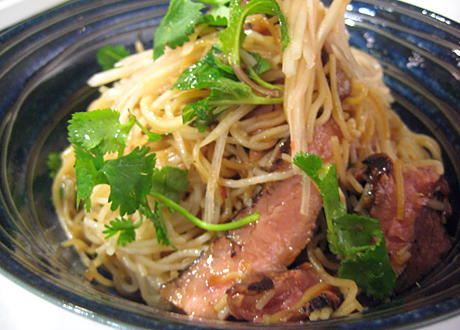 Marinated Flank Steak and Vermicelli Noodle Salad Peanuts, pickled green papaya, calamansi lime dressing – Refreshing, delightful, having just the right amount of punch with the lime. Addictive and something I would love to make at home if I could get the recipe and the freshest cilantro. Shoyu Ramen with 24 hour Braised Berkshire Pork Belly Homemade ramen noodles, perfect egg, fresh bamboo shoots – Now this was impressive and for its $15 price tag, it better be. Having enjoyed some of the best fresh ramen in Hakodate, Sapporo and at NYC’s Ippudo in East Village, this was prepared to perfection. 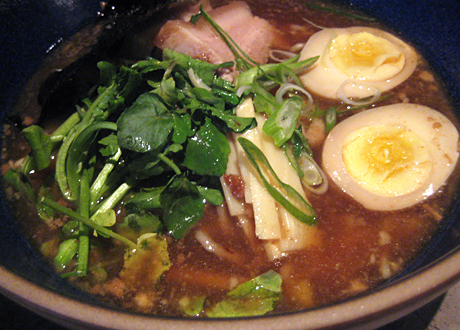 The noodle texture was the right balance of firmness and chewiness, the broth and pork belly had the right amount of flavour mixed with fat, and the boiled eggs were still slightly soft in the middle and likely organic. 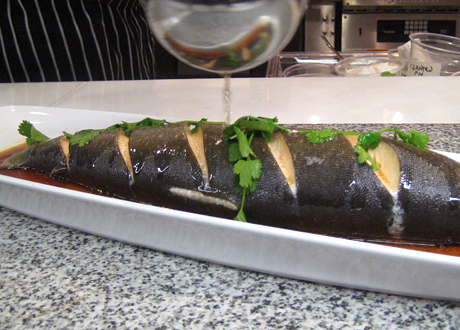 Whole Arctic Char Soy sauce, scallions, ginger – As traditional Chinese cuisine dictates, the whole fish is always brought to the dinner table. Including eyes, bones and innards, presentation is everything as is, timing. The whole fish was plump and intimidating in size but masterfully and authentically served right down to the final pouring of hot oil before serving. I’ve never had Arctic Char before but it was so delightfully moist and delicious I had a hard time stopping. Definitely a share plate! 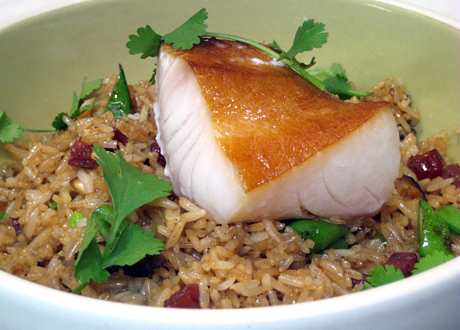 Smoked West Coast BC Sablefish Claypot Lap chong fried rice, snap peas, cloud ear and shiitake mushrooms – The quantity of rice here compared to the usual portion at a local greasy spoon differs vastly but likewise, the quality of ingredients being offered here. Fresh local sablefish is out of this world and this combo definitely hits a home run. 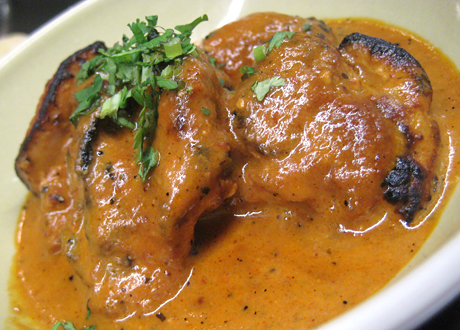 Murgh Makhani Tandoor roasted chicken, naan bread, mint chutney – This dish wowed me personally, as I adore authentic Tandoori dishes, and yet dispise the taste of mint. According to our helpful server Heather, much care is given to this dish; the mix of spices and the right balance of char are all calculated to make every part of this meal a memorable one. I couldn’t stop with the mint chutney, which surprised even myself every time I went back for it. Suffice to say, we will definitely return to try some of their lunch items, or just to have another excellent—and very authentic—“pan-Asian” meal. Take note that all of their seafood is Ocean Wise certified and they use only organic or naturally raised meat. Their Chef’s Table dining experience can also be booked in advance and accommodates parties of up to 12. Our personal thanks again to David Wong, Chad Clark and Jacob Luksic for their kind welcome and assistance. I’ve been equally skeptical and curious about this place :) Thanks for the detailed review. It’s persuaded me to try it out! Tried it for the first time on the weekend. WE LOVED IT. Great place to share food!